First appearing over the World War I battlefield in May 1918, the Fokker D.VII quickly showed its superior performance over Allied fighters. With its high rate of climb, higher ceiling, and excellent handling characteristics, the German pilots were able to score 565 victories over Allied aircraft during August 1918. Designed by Reinhold Platz, the D.VII was chosen over several other designs during a competition held in January and February 1918. 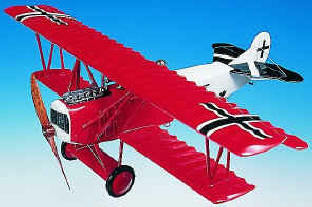 Baron Manfred von Richthofen, the famous Red Baron, flew the prototype, designated V11. He found it easy to fly, able to dive at high speed quickly yet remain steady as a rock, and had good visibility for the pilot. His recommendation virtually decided the competition. To achieve higher production rates, Fokker, the Albatross company, and the Allgemeine Elektrizitats Gesellschaft (A.E.G.) all built the D.VII. By war's end in November 1918, these three companies had built more than 1,700 aircraft. 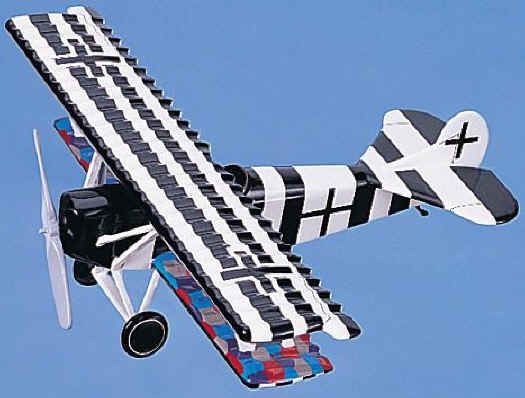 The Smithsonian Institution acquired one in 1920 from the U.S. War Department. It was originally restored in 1970 and completely refurbished in 1990 for this exhibition. It is on display at the National Air and Space Museum; Washington, D.C.
Premier Series. Incredible detailing. Check lower wing. 1/23rd scale. 14.75" wingspan x 12" long. Fokker D-VII "Red & White"
17" wingspan x 13.5" long.